Do your teeth ever feel sensitive after eating or drinking something hot or cold? You’re not alone: one estimate found that about 35 percent of the U.S. population experiences similar symptoms. You experienced what we call tooth sensitivity: tooth discomfort or pain in response to a change in temperature, pressure, or even the presence of sweet or acidic foods. So what causes tooth sensitivity? Generally speaking, a tooth feels sensitive because dentin, the main tissue that makes up the “body” of the tooth, is transmitting sensations to the nerves deep within. When those nerves relay these sensations to the brain, they’re felt as pain. But why does this occur in the first place? Let’s take a closer look at the inside of your tooth. 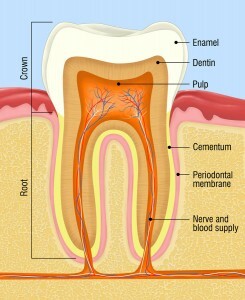 The inner structural material of teeth is the bony, but sensitive, dentin. Dentin is hard, dense, bony tissue which normally cannot be seen. It is covered by ultra-hard enamel on the visible part of the tooth, and by softer tissue called cementum on the roots (under the gumline). Dentin is made up of a large number of tiny pores or tubes. When exposed, these tubes can be stimulated by temperature or other factors, resulting in pain and sensitivity. How does dentin become exposed? Genetic factors, periodontal disease, excessive brushing – or a combination of these factors – may cause receding gums, which reveals some of the tooth’s root surfaces. Tooth decay is another cause of sensitivity. Decay may work itself all the way down to the nerves, causing escalating pain. At times, dental work itself may be the cause of sensitivity. For example, it may take a few days after filling a cavity for the tooth to return to normal. What To Do About Tooth Sensitivity? If your irritation is minor, ensure you use a soft-bristled toothbrush and that you are not brushing too long or hard. (The dentists at the Yuba City Dentistry Group can ensure you are using correct brushing technique.) Your toothpaste should contain fluoride, which strengthens tooth enamel and helps prevent erosion. You may also find toothpaste which is specifically designed for sensitive teeth to be helpful. Toothpaste without silica, which is essentially an abrasive, will also wear away less enamel. It is not common, but still available in the dental products aisles of most stores. If your tooth pain persists or intensifies, make sure to come in for an examination. We’ll diagnose the problem, and outline the best possible treatment for your circumstances. Treatment options include prescribing a special mouth rinse or fluoride varnish. Bonding agents may also be used to seal the dentin surface and provide a barrier to stimuli causing sensitivity. Most importantly, tooth sensitivity may be a warning sign of other problems. So don’t delay — the sooner we begin treatment, the better for your teeth!